From our Chinese Polychrome Collection, a stunning and large Chinese lacquered jumu cabinet, mid to late 19th century, featuring exquisitely painted birds and floral motifs on a rockwork base, executed in gilt and subtle polychromes that are contrasted against a rich red lacquer ground. 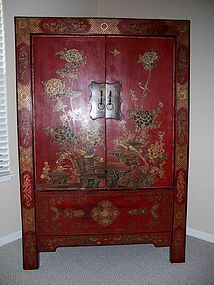 The outer frame features medallions of split tail sea dragons, auspicious symbols, and textile motifs, while the sides feature depictions of stylized floral motifs. The interior has 2 levels along with a hidden compartment. Overall this is a very majestic and stunningly beautiful piece that totally sets the tone for the room in which it is placed. The quality of the painting here far exceeds that seen on the more typically encountered jumu cabinets. Please study the close-ups to fully appreciate the detail and sophistication of the workmanship here. Size and Condition: This is a large, solid, and extremely heavy piece measuring 74 inches high, 50 inches wide and 26 inches deep. There is some expected rubbing to the enamels and giltwork along with some chipping and crazing to the lacquer, but this is all commensurate with age and use and overall condition is still excellent. We also see some areas of touch-up or overpainting of the red lacquer in the area of the bronzework near the top / middle of the cabinet, but this is quite forgiveable for such an extraordinary example.